On Oct. 28, the Canada C3 expedition will complete its epic 150-day journey from coast to coast to coast in Victoria, B.C. 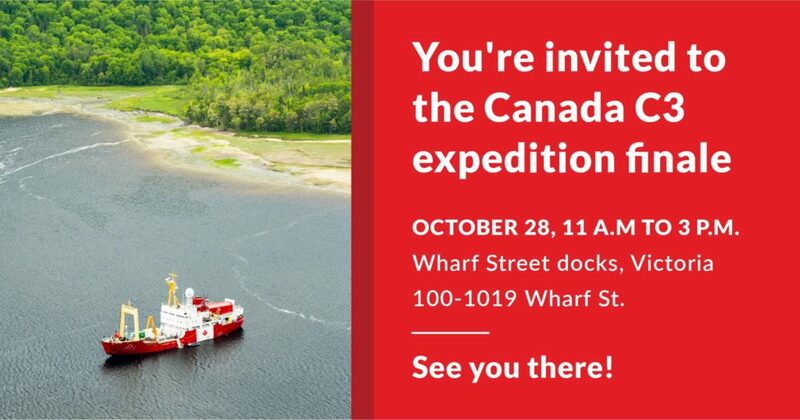 We hope you’ll be joinining us for a day of mingling with Canada C3 participants past and present, music, tours of the Canada C3 ship, food, and more! Come greet the Canada C3 ship as it arrives at the Wharf Street docks in Victoria, British Columbia! 1:00 p.m Performances by musicians Alex Cuba, Rose Cousins, Hannah Georgas, Heather Rankin, and Aaron Pritchett!